The Tempcore process for the manufacture of reinforcement bars has been developed in the seventies by Centre de Rechaerche Metallurgiques (CRM) Belgium in order to manufacture high yield strength weldable concrete reinforcement bars from mild steel billets. It is one of the most effective processes for the production of popularly known TMT (Thermo Mechanically Treated) reinforcement bars. Thermex from HSE Germany is the other process for the manufacture of Reinforcement bars. Both the processes are similar in nature and are based on heat treatment principle. These processes impart high strength to the bars using the technique of Thermo Mechanical Treatment as against Cold Twisting which is used for the manufacture of Torsteel reinforcement bars. Due to the heat treatment the micro structure of the bar consists of Tempered Martensite in the periphery and Ferrite Pearlite in the centre (Fig !). The strength to the bar is by Tempered Martensite layer while the ductility to the bar is incorporated by the Ferrite- Pearlite layer. The schematic diagram of the process on a Time-Temperature curve is given on Fig. 2. Heated steel billets are rolled in the rolling mill to the final size and shape of the reinforcement bar. At this stage the bar is processed by this process. The process is carried out in three successive stages as described below. The first stage begins as soon as the bar leaves the final mill stand. The bar is rapidly and energetically cooled (Quenched) with water through a short cooling installation, where it undergoes surface hardening (Martensite layer). 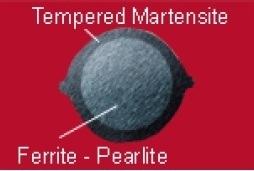 At this stage the surface layer is converted into Martensite while the core remains Austenitic. The second stage begins as soon as the bar leaves the quenching box. At this point the temperature of the core is higher than the temperature of the surface. 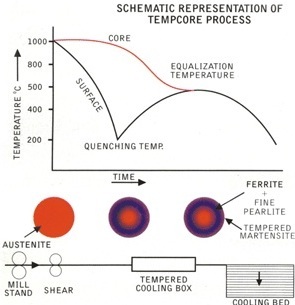 Due to this temperature gradient heat starts flowing from Core to the Surface thus tempering the Martensite layer formed in the first stage. Due to this the surface layer is Tempered by using the residual heat left in the Core of the bar (self tempering of the Martensite layer). Tempcore process has derived its name from this step. The core is itill in the Austenitic phase at this stage. .
3. In the third stage atmospheric cooling of the Reinforcement bar takes place on the cooling bed. Here the Austenitic structure is is transformed into a ductile Ferrite – Pearlite structure. The final structure consists of ductile Ferrite – Pearlite structure in the core and strong tempered Martensite structure in the outer layer at the surface. This gives the reinforcement bars a unique property of strength in combination with ductility. 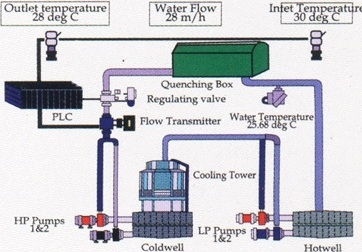 The process flow is shown in Fig 3. Reinforcement bars roduced by the above process have excellent properties which are superior to the properties exhibited by Cold Twisted Deformed (CTD) bars. The properties of the reinforcement bars are given below. It has high strength due to tempered Martensite layer at the periphery of the rod. The strength of the rod can be varied by controlling the thickness of this layer. It has high ductility due to Ferrite Pearlite structure in the core. Because of this property the bars can be bent easily at construction site. The bars have ability to be bent, galvanized and straightened without cracking or loss of tensile properties. The severe bending of the reinforcement bar is shown in Fig 5. The bars have a good bond strengfh. The bars have high ductility and toughness at low temperatures even when damaged mechanically or by welding arc strikes. The bars show absence of significant strain age embrittlement after bending and galvanizing. The bars are fully weldable. The bars are produced from steels having low Carbon Equivalent (CE). The bars are compatible with all mechanical reinforcing bar splices commonly available to join bars for both compression and tension loading. The bars resist loss of strength at elevated temperatures. This proerty is very important in case of fires. Practical results have shown that reinforcement bars retain more than 70% of its yield stength in case of Fe 415 grade of the bars and 40% in case of Fe 500 grade of bars. The bars meet the fatigue strength requirements as per European standards. For most steels, shear strengths fall within the range of 60% to 80% of the tensile strengths. The reinforcement bars are having a shear strength which is towards the top of the range. These reinforcement bars has superior seismic resistant properties. Tests conducted with these type of reinforcement bars have shown that its performance under repeated reverse loading with inelastic strains (Normally encountered during an earth quake) is better since the energy dissipation is almost the same for each cycle and uniform ductility is maintained till failure. The reinforcement bars are produced by an on line process hence it has got consistent quality. The combination of high strength with high ductility in these reinforcement bars imparts safety to the structures made from these reinforcement bars. Fabrication activities with these reinforcement bars are simple and easy. The high strength of the reinforcement bars resuts into saving of steel. Thank you very much Sir, it was very useful TEMCORE knowledge. But Effect of each micro-alloying element on TEMCOR process and Cooling curves(If Possible) to be posted Sir. May kindly be edited for certain spelling errors.